I love being able to extend a meal further and further! On Monday we went to King Richard’s Faire for the day. We were going to be gone pretty much the entire day and coming home at dinnertime, so we decided to cook a whole chicken in the crock pot while we were gone. The recipe we used was sent to me by my crock pot cooking partner in crime, Gina. She’d tried it a week or so ago herself and deemed it a keeper. It is from the site 100DaysofRealCooking.com, and it looked so easy! The best part about it though, it gave instructions for putting the bones back into the crock pot and continuing to cook them overnight, creating chicken broth! I thought that was the greatest thing! 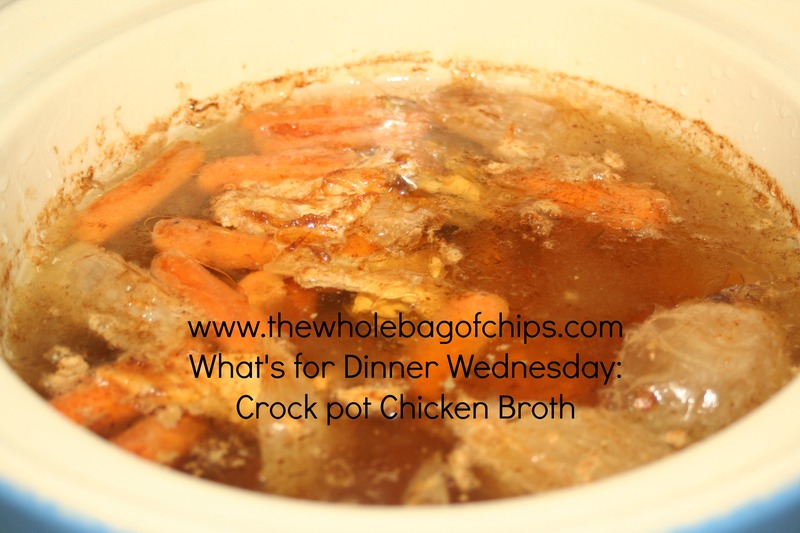 A whole chicken dinner is usually at least two dinners for us, but this would give us a third option: chicken broth, which would be put to good use in the future for soups and other recipes. I use a lot of chicken broth here, so I couldn’t wait to see how this worked out. We cooked our chicken all day, as instructed. Once we ate, Don cleaned off what was left of the usable meat, and threw the rest in the crock pot with the onions and carrots we’d used for the original cook time. We filled the crock pot up with water to the top and turned it on low. It cooked all night long. The house smelled so good! I can’t wait to use our homemade broth in our upcoming meals! I shut the crock pot off and let it cool down a little bit before emptying out as many big pieces of bones as I could and beginning to strain the broth into containers to freeze. In the end I had four containers of broth for future use: two 4-cup containers and two 2-cup containers. I put them all into the freezer and can’t wait to use them for an upcoming meal! 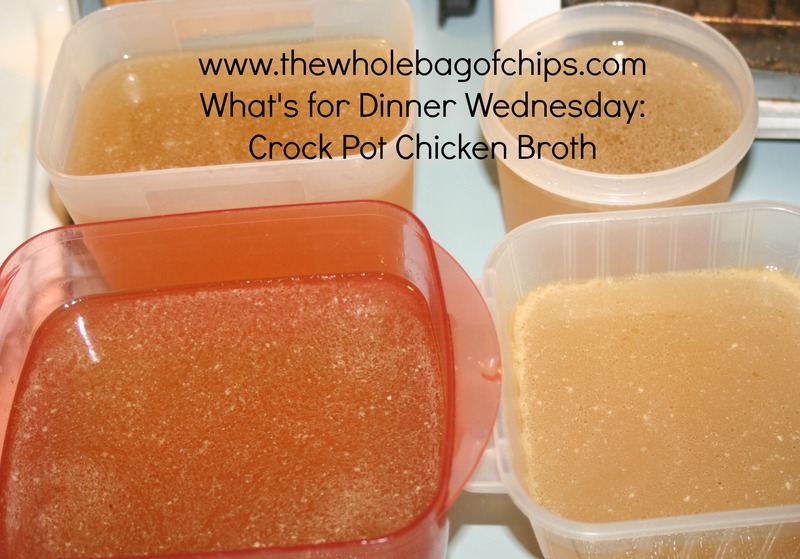 A lot of our soups call for a chicken broth base even if they’re not a chicken soup themselves. And the best part of all: there’s still all the leftover chicken in the fridge for a leftovers night this week as well. I love a budget-friendly meal! Tried a new crockpot recipe that fits your criteria for easy and you might just have the ingredients on hand: boneless chicken (can be frozen), 5 breast pieces, can of black beans, can of corn, jar of salsa (any kind) — simmer for 4-5 hours then add a pkg of cream cheese for the last 30 minutes. I served over rice. My 5 year old granddaughter devoured it! Have been enjoying your blog since your daughter went to DC!